June must be getting close. Rumors about Apple’s presumably inevitable next generation iPhone(s) are flying left and right. One day, the iPhone talk is all about a small, cheaper phone in the works. The next, the phone has grown. And that’s what we’ve got today. DigiTimes is reporting that, according to “upstream component suppliers,” the next generation iPhone, or “iPhone 5,” will go to a 4-inch screen. That’s up from the relatively-small 3.5-inch iPhone 4. 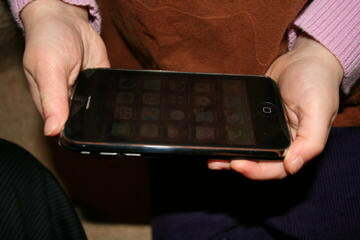 A 4-inch iPhone would put the “iPhone 5” more on-scale with a number of Android-based devices that have a display at least that large. In fact, every single notable next generation smartphone measures more than 4-inches. Officially announced Monday at Mobile World Congress 2011, the LG Optimus 3D measures in at 4.3-inches, as does the Samsung Galaxy S II. And the just-unveiled Acer Iconia will have a monstrous 4.8-inch screen. To put these sizes in context: The hand of an average adult male measures around 3-3.5-inches wide — which likely had something to do with the current iPhone’s size. With increased screen sizes, our smartphones are able to do more, and look better while they’re doing it. For instance, phones that are able to not only play back 1080p video, but shoot it, wouldn’t be nearly as functional or impressive if they came loaded with smaller, practical-sized screens. Because, let’s be honest, carrying around a 4.5-inch device in your pocket isn’t exactly fun or practical. So considering the smartphone industry seems to be headed toward larger and larger devices, it seems reasonable enough that Apple would offer a larger version of the iPhone. But remember: Apple likes to buck the trends of its competitors and start their own. Be prepared for them to go a whole different direction. Or, perhaps, to go all directions at once by expanding their iPhone line to include three different devices: A larger, 4-inch iPhone for media-heavy users, a classic size and an iPhone Nano for the kids. Oh, will you look at that, there’s already a rumor about that, too.